It is easy to dismiss Filmora as an editing solution because of its apparent simplicity but for me personally its simplicity is the whole point! In the video below you can see a demonstration of three ways you can use the “Blending Mode” module in Filmora to complete three very different tasks. The first as an overlay workaround, the second as an animated title effect and the third as a video image correction tool! When you go to the Export or Produce tab in just about any video editing software these days you are generally going to be presented with an array of choices. Thankfully those choices are predominantly preset where the developer has done the hard work and found out what you should be doing even if you don’t! For example of you are going to be uploading to FaceBook or YouTube the software will choose the best settings for you to retain perfect quality… or at least as perfect as it can be once FaceBook and YouTube have finished re-processing it. In almost all of those modules you will see the dreaded “Custom” button and if you dare to click on that a whole new world of pain and confusion opens up! Resolutions and frame rates and bit rates an on and on! One of the most misunderstood or at least not understood is bit depth. Check out the video below for a relatively painless explanation of what bit depth actually is. It is an effect in photography as old as time and let’s face it, in video editing is about as easy as it can get once you understand the basics of overlays and transparency. However the old rule that says just because you can do it doesn’t mean you should do it, still applies. Random overlay tracks with transparencies backed up with no forethought or planning can look pretty naff! Check out the video below for some tips on using this technique with a little more taste. About once per month the folks at CyberLink host an online webinar covering various aspects of using their video editing software suite, PowerDirector. It is usually quite long but the detail and walk-throughs they provide are very good and give great insight into how you can maximize your usage of the program. Like most modern video editing software these days PowerDirector is a pretty powerful editing solution but it is only as powerful as your knowledge of it. Although a little technical at a few points this is quite a good guide into how you can achieve a number of variable lighting scenarios in one room. Most of the setups require minimal equipment and of note is the fact that a few of them use available light such as room lights, desk lamps etc. Much like color correction and color grading tend to get a little confusing, sound editing and sound mixing also suffer from a lack of clarification. Sound Editing is the actual recording and creation of sounds both on set and off set. Sound Mixing is the process of adjusting the levels of all the individual sound layers. 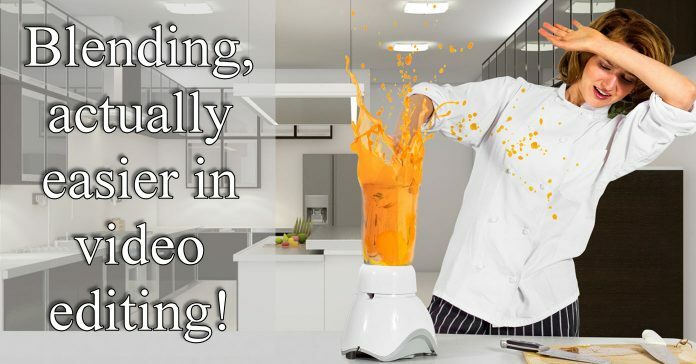 As far as sound goes for the average amateur video maker these two activities kind of get smooshed together inside your average video editing software in the same way that special effects, color correction and just about everything else gets smooshed together! In a fully pro situation probably just about every button or dial you see on the interface of your favorite video editing software has an entire production department dedicated to it! What’s the Difference Between Sound Editing and Sound Mixing? The video below is a comprehensive look at using a smart phone to shoot videos whilst achieving professional looking results. As each year passes the video capabilities of your average smart phone is getting better and better so these days that phone is more and more becoming the “go to” option for video. Given that increase in quality it is also important to note that just because a phone can do it does not necessarily mean it will do it by itself! You still have to know how to use it effectively and more importantly you have to know its shortcomings to minimize any lack of quality they may cause. The video has been created with a specific audience in mind and as such tends to concentrate on points relevant to content creators for commercial purposes but don’t let that put you off if you are not in that category. There are lot’s of tips for anyone that wants to lift their smart phone video game to a higher level. There have been many times over the years when I have been fulfilling my duties as a moderator on a few support forums and come across this problem. The person posting on the forum or even in the comments section of a blog post has referred to some piece of video footage and asked how to replicate what that footage showed. Thinking to myself that this should be pretty easy I click on the footage they are referring to and bingo! It is a professionally produced, all dancing, all singing clip that took an army of editors and SFX guys to put together! Yet despite that the original poster thinks that somehow with a little point and click magic, he or she is going to reproduce the whole thing. Yes, modern video editing software at the amateur or enthusiast level can do a lot of things only the pro’s could do a few years back but let’s keep it real here! Check out the article below and especially check out the image that goes with it to see just how complex a fully pro editing timeline looks well into the process. This is a pretty straightforward tutorial on adding some of the canned special effects in Filmora to replicate a scene from Star Wars. One of the main reasons I have added it is that it shows quite clearly the process of adding an effect to create an interesting video. However the real value is in watching how carefully the effect is added so as to maximize that effect. In the Star Wars movies obviously there is a special effects team the like of which you or I will never be able to copy! Simply adding an effect from a consumer level video editor is never going to re-create anything like the original BUT! If you just take that little time to add that effect intelligently then watch it over and over until you can tweak it into shape you can make it look pretty good. Even in a very basic editor like Filmora good things are still possible with the only trade off being that little extra time it takes to get there. Easily one of the greatest drawbacks in using microphones when shooting videos outside is the incidence of wind noise. Probably the worst offenders are on board microphones that most cameras and smart phones have. I seriously think as part of their design they actually try to make the mic pick up as much wind noise as possible just to annoy us. Anyway, most video editing software (if you look deep enough) will have some kind of noise reduction system in place that you can use to remove that noise. Well… that’s what they say on the box anyway. The reality is that because wind noise is completely random it is pretty hard to design a filter to fully remove it. The video below goes over the use of the wind noise removal tool in PowerDirector which is one of the better ones out there. You will notice that even though the guy in the video knows the software well and can use it very effectively, the wind noise is not fully removed although it is improved dramatically. Because wind noise is so unpredictable it is very difficult to remove it completely so the real answer to this problem is to not record it in the first place. Professional sound recordists tend to use an array of physical filters on their equipment depending on the conditions but generally they are either the “dead cat” solution or foam rubber. The dead cat is the big fluffy one you see covering microphones on outside shoots. Anyway after looking around at available solutions myself over the years I at least know this. There is no software solution that is going to remove all wind noise and at the same time leave the rest of the audio intact. The best way to deal with wind noise is to not record it in the first place so I go with this one that can be adapted to just about any device with an on board microphone. Home Made Wind Noise Solution.